Model T Ford Forum: Am i missing something? Model T Ford Forum: Forum 2014: Am i missing something? 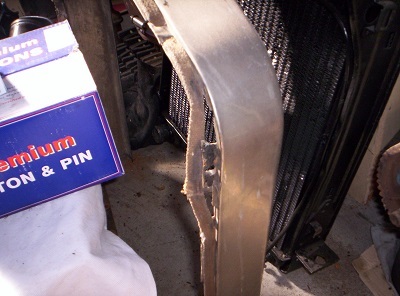 Is the exterior metal shroud that covers the radiator only held on with the two lower bolts and the pressure from when the hood is latched? It seems like there should be some further reinforcement toward the top. 4 bolts and nuts, 2 each side, bolt to the radiator, they are under the lace that runs around the shroud that the hood sits on. Kerry, so i am missing something ? , i still don't understand. So the two spring loaded attachments to the frame, plus the two screws secure the shroud. Hopefully your radiator isn't missing the upper points. What year? 1917 to 23 just the two lower bolts and the radiator neck. I have seen 24 to 25 that mounted the same way but was informed that they might have the same tabs as 26 to 27 which had tabs mounted to the radiator that the shell bolt to. The listing in the catalog has been wrong for many years now. Someday they will fix it. Thank you John, there are two upper brackets which appear to do nothing. Guess i am missing the bolts to secure it,..much thanks! Mark if i had my way we would make a rubber gasket between the shroud and the radiator neck to keep it nice and snug. Thank you Kerry for the pics..much appreciated. The great thing about this forum is just what happened. I had a simple question as a newbie about a simple problem, and it was solved in a matter of minutes. Thanks guys, you are the best. John, Mark has pointed out the differences. It depends on the year of your car. 1917-22 cars with the low radiator and parallel sides on the shell had no bolts and brackets other than the two mounting nuts at the frame. 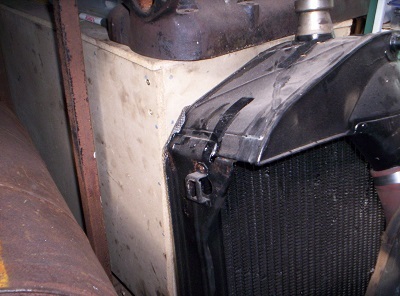 The two bolts hidden under the webbing came on the later taller radiators. I do not know if all the tall radiators had them, but the later 26-7 nickel plated brass shells on our Canadian sourced cars had them. Note the bracket on the radiator near the top above. That is where you insert a 1/4-20 square nut, 1/2" across the flats. A flat head slotted screw is what goes through the shell, and as mentioned is hidden behind the lacing.